Survey finds that 40% of research-intensive universities mention the controversial metric in review documents — despite efforts to dampen its influence. The vast gender gap in Japanese science has leading women researchers calling for change. Sorry, economists. A new study pinpoints the age at which Nobel Laureates produce their transformative work. Moving countries to further a career in science has its benefits, but it isn’t an option for everyone. Six scientists whose transformative work reaches across borders. Insular institutions seek ways to better accommodate international research partners. The BioRender web tool lets researchers easily create sophisticated scientific illustrations. A confession: I can count on a single hand the number of women I have invited to collaborate with me on publications and grants. Global teams shy away from risky research. Multimillion-dollar experiment generates tools to study marine microorganisms. Following these guiding principles for sharing data can help researchers get ahead. Peace and common membership of the European Union have allowed scientists in the Republic of Ireland and Northern Ireland to build a unique, cross-border research system. More than 1 million studies are now downloaded from the site every month, mostly in neuroscience, bioinformatics and genomics. Radar data of the red planet’s south pole had scientists deliberating over the possibilities. Could it really be liquid water? The growing clamour for open access results makes scientists vulnerable, say Alexandra Lippman and Christopher Kelty. A massive study on the planet’s biomass was among the top five most talked-about articles of 2018. Smaller member states are the beneficiaries of China's global trade and diplomacy project. The FAST telescope dish, stretching half a kilometre, will thrust China’s radio astronomers into a role of global leadership. China’s nanotech industry is forging ahead, with high funding levels, a maturing talent pool, and international experience. A dire warning from climate scientists was the second most discussed paper in the past year. The work of female researchers has a broader impact than citation analysis suggests, but not in India. One of the year’s hottest papers shows online story-tellers are lukewarm when it comes to truth. Global production of scientific papers hit an all-time high this year, estimates show, with emerging economies rising fastest. Few Chinese researchers are regarded as global leaders, as the pressure for rapid output prevails. A new microscope allows researchers to track single cells in developing embryos, forward and backward in time. A permissive regulatory climate and a pragmatic approach has seen China’s bioscience sector soar. Studies to improve the productivity, resistance and taste of rice crops are central to China’s commanding position in plant biology. To become a world-leading scientific nation in every sense, China needs to close the quality gap. 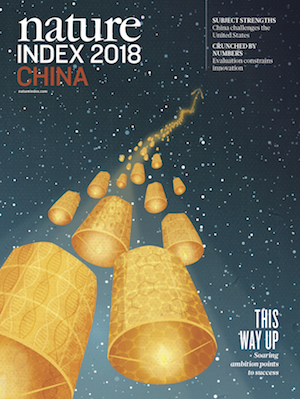 A hive of innovation, Wuhan has stormed up the Nature Index, but competition for talent is heating up. Research is elucidating a complicated phenomenon. A rich research network has secured Munich’s position as a centre of science in Europe. Public involvement in science has citation benefits, but these are often fleeting. A massive collection of sea creatures turns out to be a gold mine of research opportunities. Scientific innovation has long powered the San Francisco Bay Area’s economy, but community and political challenges could undermine progress. Global survey finds that unclear publishing policies place an additional burden on many scientists who don’t speak English as a first language. Businesses spent a small, but growing, amount of their R&D budgets on basic science. The growing contribution of second-tier cities is narrowing the gap in research production. The Latin American hub carries the scientific weight of a financially stricken country. Africa’s science star is confronting its colonial past to set a more inclusive research scene, benefitting more of its citizens. Logging hypotheses and protocols before performing research seems to work as intended: to reduce publication bias for positive results. Only 3% of EU grant funds went to new entrants to the union between 2007 and 2016. Scholars fear that affiliation with the high-status Thousand Talents scheme could make them targets of FBI investigations. Study finds "wasteful" skew in biomedical research funding towards those at the top. A lack of trained administrators is holding African scientists back. Research institutions have a duty to foster integrity, and that includes monitoring. Strength in different sectors, subjects and regions contributes to a country's success. Too many tools used to promote accountability benefit research managers and for-profit companies at the expense of individual researchers. Industry funders routinely take charge of analysis and reporting. The Nature Index looks at the share of science medals and prizes that have gone to women. Although﻿ China leads the pack, fast-moving institutions are building their research reputations the world over. Universities need to prepare researchers for life beyond academia. Two new measures aim to assess researchers' independence from their former lab heads. These institutions have made great strides over the past three years in their production of high-quality research. How predictable is scientific success? Even sophisticated, data-driven models of academic careers have trouble forecasting the highs and lows. These newcomers are making their mark in science across the disciplines. In academia’s great migration, some researchers are at a disadvantage. 'Most highly cited' criterion is not the most appropriate. Scientists in emerging economies respond fastest to peer review invitations, but are invited least. "For twenty years people had been telling me how lucky I was to be in our field of research because 'things' were changing for young women. Twenty years later 'things' had not changed. Researchers replicated 62% of social-behaviour findings published in Science and Nature — a result matched almost exactly by a prediction market. The technology has potential to solve some transparency problems, but there are many obstacles to clear first. We need to define impact more clearly to be able to measure it effectively. Outcry greeted the news that a Tokyo medical school was rigging entrance exam results to favour men, but prominent female scientists say the problem goes further. From the top of the wave the view is sweet, but it's all too easy to fall off. It's bad news for Z but A is AOK for authors listed alphabetically. As China’s scientists strive to produce research with global prestige, urgent local environmental problems jostle for attention. How freely should scientists share their data? The Open Science movement champions transparency, but how much and how quickly is a matter of dispute. Radical proposal will be difficult to implement, say NGOs. Smaller countries rely more on regional collaborations than on domestic interaction. A US project is exploring the use of software to assign confidence levels to published research. Interdisciplinary encounters across the geosciences are yielding new insights into the workings of Earth and beyond. Foreign faculty in Japan are less productive than their local counterparts on many measures, but better connected to global collaborations. Marketing algorithms prevent many women from seeing the advertising, even though it’s illegal to target jobs to one gender. Report recommends removing obstacles to the conversion of scientific research into products and services. Researchers call for a change in evaluation to recognise the importance of reproducibility. The younger generation sees a collaborative system as key to discovery and advancement, a three-year tracking project reveals. The government is trying to bolster its research workforce but academics say more needs to be done to improve the sector. The scale of growth in cities challenges scientists and policy-makers. Institutions in China and Japan dominate the chemistry top 10 in the Nature Index. One of them does not yet exist. Large pharmaceutical companies dominate the list of leading corporate institutions in the index. Academic reward structures discourage the pursuit of vital research. Describing the benefits of excellent research in simple language gets high marks in the REF. One-quarter of surveyed institutions admit to not complying with guidelines. We look at the top 5 Earth and environmental science articles by Altmetric Score from 2012 to 2017. Funders Jean Lebel and Robert McLean describe a new tool for judging the value and validity of science that attempts to improve lives. Discover the trending terms in the field, from climate to water and meteorites to mercury. Two years since the Institutions of Eminence project was announced, none have been selected. Networks of researchers across disciplines and across the world are working to solve some of humanity's biggest problems. By modelling the course of climate change, scientists are building an arsenal to prepare for its impact. The free, online outlet is one of a growing number for academics on the continent to share their work. They fear the online platform will become less open, but other researchers say the buyout could make GitHub more useful. Lack of independent oversight in examining alleged breaches leaves academics at the whim of institutions. From a failed coup in Turkey, to prolonged financial crises in Greece and Spain, researchers in the region are struggling to keep up. These top 10 institutions in the Nature Index were the largest contributors to papers published in 82 leading journals in the past year. And the key to its popularity is the online repository and social network, GitHub. Two Beijing-based universities are among the top 10 academic institutions in the Nature Index. A revised list of journals improves the balance of disciplines between the natural sciences. The country’s highest executive body issues clear guidelines for dealing with scientific misconduct. Study reveals how research evaluations can lead to self-serving behaviour. Most researchers agree that drafting papers and interpreting results deserve recognition — but opinions don’t always match authorship guidelines. A study identifies papers that stand the test of time. Policies should account for the institutional factors that discriminate against women. Multi-national study challenges long-held assumptions about efficiency. Palaeontologists, biologists are among researchers whose social media reflections reveal what they have given up in the pursuit of science. The small university stands out for its citation impact relative to its size. Gene collections and astronomy studies dominate the list of the most-cited publications with DOIs on the popular online encyclopaedia. Women receive fewer and smaller grants across the world. Until recently, many university and society journals operated at a loss, says Gavin Moodie. In just a year, the number of Indian institutions in the Times Higher Education ranking has risen by 15 to 42. A per-capita analysis of physics, chemistry and medicine laureates since the turn of the century reveals the United Kingdom as the most prolific nation. Funders should assign research grants via a lottery system to reduce human bias, says Dorothy Bishop. The higher-education advisory agency is cleaning up its registry of approved journals, but academics say the list should be abolished. The isolated nation publishes fewer than 100 scholarly articles a year — but as political tensions thaw, researchers hope for greater collaboration. The scientific method is not applied in dealing with aberrant research behaviour. Making data available to the larger scientific community has many benefits. Workloads influence when authors submit papers to journals. An institute’s work on warning and mitigation systems for catastrophic events is a national priority. Osaka University bets on commercial-academic collaborations to survive. Institutions could do more to support researchers who have disabilities, says Aaron Schaal. The REF’s approach to impact incentivizes research that can be obviously linked to outcomes. Across the scientific fields, Japanese researchers are bringing together the virtual and real worlds. Noted journal among several reducing article counts in a competitive market. The new metric will account for annual global changes in the Nature Index corpus. International collaborations are rising, but not enough to put Japan on the global researcher circuit. A survey of Canadian scientists finds that evidence-based policy is a top priority. Clever email strategies can help fight the scourge of academic inboxes. An analysis of review length raises questions about what quantity means for quality. Japan's vision of a high-tech, 'super-smart' society relies on sustained investment to arrest scientific decline. Anomalies in the third national assessment of Indian institutions intensify criticisms of linking the exercise to funding. Efforts to improve Japan's scientific status include top-down institutional change, but tradition is hard to break. Finding purpose and meaning in the lab. University of California libraries tackle the transition from subscription-based publishing to sustainable open access. Scholars love to hate the journal impact factor, but how flawed is it? Gender pay gap reports reveal extent of male favoritism in the UK. Australian academics will need to prove that they have demonstrated the usefulness of their work to communities, industry and government. Consideration should be given to the research impact agenda’s effects on female academics, say Julie Davies and Emily Yarrow. With permanent academic jobs scarce, the government wants industry to utilize young talent. Science super-ministry gains new remit to develop policies that benefit international researchers. Gakushuin University is the top-ranking institution when assessed on the quality of its research in the natural sciences. Following the shutdown of Beall’s list, blacklists that warn against questionable publishers are in demand. COMMENT: Large pharmaceutical companies do not target their scientific efforts on the deadliest diseases. Public regard for scientists is as strong as ever, but you wouldn't know it. Publishers can deny access to the majority of open-access articles at their discretion. A new service allows researchers to access raw social media data. Less than 15% of researchers in Japan are female. Urgent culture change is needed, argues Noriko Osumi. Not so fast. Who really leads the world in science? China produces the most scientific articles, but lags on other measures. Survey reveals reluctance to take open peer review to the limit. A regional alliance of researchers is giving voice to a neglected community. Tool that tallies engagement with new biomedical concepts seeks to reward novelty. Efforts to increase diversity in research assessment panels don’t cut it. It's hard to believe, but the two largest rivals for global science leadership, are also the closest companions. It’s wrong to dismiss preprint repositories as the junkyards of science, warns Ioannidis. China climbs the THE Asian university rankings, but Singapore is still first. A proliferation of partnerships between academics and development practitioners pose ethical and practical concerns. A single field is behind the rise of thousand-author papers. A controversial fossil discovery has whipped up online discussions about alien life. Small countries have an outsized presence among the scientific elite. A Prestige Index exposes the gender bias in author lists published in top science journals. More countries are taking part in cross-border partnerships, but inequality remains. COMMENT: In a noisy arena, scientists must become more effective communicators. A system for bringing premature baby lambs to gestational term caused much online debate about whether the technology should be applied to humans. COMMENT: A professor reflects on his privilege. Flesh and feathers trapped in amber were the talk of the internet in 2017. Without clear and consistent terminology, policing can be tricky. A study revealing that girls are more likely to link brilliance with boys than with their own gender made headlines on the web. COMMENT: Life science companies are missing out on the benefits of open innovation. A gene-editing breakthrough topped all other papers for online attention. Five scientists discuss the reasons they moved to an industry lab. Stepping back from in-house science, companies are relying heavily on universities and government institutions for knowledge. The stigma has a punitive effect on citations for prior collaborators of fraudulent researchers. The Japanese government wants to lure more industry funding into universities, but companies need to be convinced they’ll get value. New findings suggest corporate collaboration encourages academic productivity. Survey finds that women are more prone to recognizing honorary co-authors in papers, but less likely to pad citation lists. COMMENT: The withdrawal of large US corporations from research is narrowing the scope of innovation. Research partnerships between industry and academia have more than doubled in five years. Exploring complementary strengths is the key to success in industry–academia science partnerships. Companies publishing high-quality research are looking to academia for assistance. What if it was funders and libraries instead of authors who paid processing fees? In trying to thwart predators, the government is penalizing researchers who publish in genuine open-access journals. There’s no substitute for physical proximity, say researchers. Papers authored by academic and corporate partners are more widely discussed online. Papers from China are growing in influence and volume, yet the US remains supreme. Unfettered inquiry now has a publishing outlet. Students in research: Cost or investment? Undergraduate research programmes are expensive, and the benefits can be hard to measure. Researchers develop a tool for tracking academic activity and impact on WeChat. Key investments in people and infrastructure have turned Illinois into a state of substance. 7 out of the top 10 universities in the QS World University Rankings 2018 are in the east-Asian nation. Too much focus on generating new ideas in science is driving the replication crisis. The lack of research institutes with links to Africa has scientists worried about the next Ebola outbreak. Researchers point to options for tackling bias against competitors. Call for tougher sanctions in response to growth in papers recalled for misconduct. COMMENT: National initiatives that track people, rather than papers, will lead to better science in the United States. The upstart wants to copy its neighbour's academic success. Where next for Catalonian science? Push for Catalonian independence evokes mixed reactions from scientists in the region. Even if the biggest cuts since World War II don't eventuate, alternative funding sources must be found. An open society makes Canada an attractive destination for students and scientists, but only as long as government promises for increased funding are met. For centuries a hub of ideas and trade, London is embracing ambitious developments to boost research and local connections, despite the uncertainty caused by Brexit. Declining outputs in California, Massachusetts, New York and Maryland have made the biggest dent in US science. Junior researchers left out of collaborations in key science fields, study finds. With the most to lose from looming federal funding cuts, California's researchers take a stand. At the current pace, China could overtake the US as the global science leader within a decade. China's political and economic centres connect on a scientific level. A parliamentary hearing on research misconduct finds little evidence of improvement. What does it take to create a metropolis of knowledge and innovation? Barcelona lures scientists while Madrid is bound by bureaucracy. New York's expensive office and lab spaces have deterred innovative life science firms, but with growing support for start-ups, the scene is changing. Open-access publishing held to the same standards as paid subscription journals. COMMENT: Most of the world's research and entrepreneurship is concentrated in a few megacities. Women peer review fewer papers than men but are more likely to reject the papers they review, a new study shows. A focus on basic research is shifting scientific resources from Seoul to South Korea's central city. Nature Index 2017 Science Cities looks at the challenges for established science cities and highlights some rising hotspots. A new model suggests bias towards novel results is driving down reproducible research. Lack of clarity on changes to the country's research assessment system provokes anxiety among early-career researchers. Many fear a plan to elevate 42 universities to world class status will deepen inequality. Online tools are lightening the load for authors and journal editors. Transparency should be the new normal, says peer review leader. Researchers in the UK find that the impact factor of journal articles matches judgements by a panel of experts on research quality. Gender proportions in medical schools are almost equal, but disparities persist further up the ranks, a new tracking tool reveals. The committed team behind the observation of gravitational waves is up against nature. Do Chinese government reforms designed to thwart academic fraud go far enough? An analysis of a popular reputation metric concludes it relies too heavily on social interaction. COMMENT: Numbers on science and innovation do not always reflect performance. Researchers disagree over whether performance-based metrics adversely affect publication behaviour. 140 institutions in the United States have spent five consecutive years in the Nature Index top 500. A few institutions in the United States, China and Germany make it into the top 500 for the first time. Harvard University holds the top academic spot for five years straight. Bogus journals and their victims are widespread, study finds. Taiwan slips to number 20 as graduates’ interest in science fades. China has the largest number of institutions that have risen up the top 500 ranks over the past five years. For innovation to bring public benefit, mapping the influence of academic papers is just the beginning. Some papers have a profound and obvious influence on future research and industry applications. Patents citing these life science papers indicate their bearing on developments which have widespread health implications. New preprint services could bring niche scientific communities into the open. An analysis of the biggest industry influencers in four charts. Collaboration with companies will become more important in the government’s science and technology strategies. For the love of discovery, a biochemist freely shared the research which laid the groundwork for widely-used drugs. Would you rather send a short video or a lengthy written proposal for funding? COMMENT: Should research funding be allocated through voting? An overhaul of Japan’s competitive grants programme could revive the country’s international science standing. A Beijing DNA experiment boards the International Space Station. An encounter between two visiting social scientists at the University of Oxford was the catalyst for a unique partnership. The country's research contribution is continuing to overtake other nations. A few large institutions produce the majority of articles in the index. COMMENT: Fierce public debate over GM food has put pressure on Chinese researchers to engage with the public about their work. China's growing economy is also fueling an increased demand for psychologists in the country. Scientists are more concerned about the impact of sloppy science than outright scientific fraud. Psychology is an increasingly relevant discipline as the destabilizing effects of rapid social change take hold in China. Officials move to stop the widespread poaching of talented researchers in China. Researchers wrestle with a measure of collaboration increasingly used to assess the impact of their work. The region's natural and cultural bounty are making researchers worldwide take notice. Open science has made progress in China, but there is room for improvement. COMMENT: Cited work often has little, if any, influence. Find out how the top 20 institutions in the QS University Rankings 2018 measure up in the index. California, Massachusetts and New York produce the most high-quality research, but their output is in decline. The industrial city of Changchun is losing young researchers to more prosperous cities in the south. The ‘One Belt, One Road’ initiative will expand scientific collaborations with 64 countries in the region. China's higher ed reforms are ambitious, but can they address systemic issues? The country is casting a wider net for excellence in higher education. Can the country maintain its growth in high-quality science? Early-career researchers in the UK are less likely to choose open access over subscription journals. Japan's gambit to globalize its scientific research is paying dividends. Although government efforts to encourage innovation face significant obstacles. New report identifies what can make or break a good international collaboration. Former microbiologist Sue Thomas will lead the Australian Research Council from July. Journal editors tend to accept manuscripts written by prior collaborators more quickly. The university's president talks about the need for Japanese universities to stay competitive on the international stage. It was the first Japanese university to establish a venture capital firm. To unleash the potential of universities as engines of economic growth, further investment is necessary. International team publish landmark paper on debilitating form of childhood epilepsy. Nobel laureate Yoshinori Ohsumi’s persistent study of baker’s yeast spawned an exciting new field, and proves the value of supporting scientists in pursuit of their passion. Scientists reluctant to publish clinical trial results found to be a major contributor of research dollars wasted. Despite being among the top science nations, Japan's publication output has stalled over the past decade. The country's research output is falling behind other dominant science nations. What price will Japanese science pay for austerity? Japan’s stagnated research output corresponds with a deteriorating situation for young researchers. OECD survey reveals the country’s science spending frenzy, noting a need for investment in innovation and invention. Years of groundwork underpins rise in research collaborations. COMMENT: Ignoring evidence when deciding where research funding goes will not lead to high quality research, says Adrian Barnett. Several factors can help institutions secure one of these sought-after grants. G20 countries dominate global research spending and production, but the mix is changing. A large computing network that has helped design cancer drug candidates and search for extra-terrestrial life is struggling to maintain its volunteer network. As Donald Trump’s bid to reinstate his travel ban failed last week, three Iranian scientists speak of their fears amid the uncertainty. Female researchers in engineering receive fewer citations, despite producing high-quality research. A social welfare programme for women at risk of HIV has built trust between this vulnerable group and scientists seeking new treatments and a cure. Size does matter when it comes to research performance. More scientists could help sustain the country's recent growth in research output. Applying for ethics approval cost Adrian Barnett's research group $348,000 in staff time, and delayed the research by six months. A discovery in an ancient Chinese pot would reveal one of the oldest records of beer production. Tracking the careers of leading scientists reveals maintaining an edge is harder for women in Italy. Citations don't always reflect the quality or impact of a researcher's work. Locating a country in the title of a scientific paper may lower its visibility. The country has become a renowned destination for the paleoanthropological community. Writing style and grammar can affect an article’s citations. Academics can learn a lot from the corporate world. Apportioning author credit in large collaborations is as problematic as the Nobel Prize’s rule of three. If funding applications were made under open access, science would benefit from more universal scrutiny. Australia is urged to become the first country to offer businesses loans to fund research and development with repayment terms contingent on a company's future profits. An encounter helped kick-start the development of new cancer drugs. Does proximity play a role in science collaborations? Proximity is just one factor driving the high number of collaborations between top performing institutes in the same city. Uncertainty surrounding Britain’s future in EU research may be damaging science. China's appetite for patents leads the world. It's time for the academic community to put action to words and stand up for greater gender equality. Research partnerships between the two superpowers outnumber all other international pairings. The Japanese capital is a hub of local research collaborations. Paris excels in intra-city collaborations but needs to look beyond its borders to increase research performance. A new program is encouraging climate change research partnerships between two research powerhouses. Growth in research partnerships was most pronounced in the life sciences. A pragmatic and deliberate approach to research funding yields impressive results for New Zealand. A new online award that recognises the contributions of highly-productive peer reviewers also highlights biases in the system that underscores scholarly publishing. Ranking systems for universities need to be re-evaluated. New Zealand universities are building an international reputation for high-quality research. There's not much separating the top three Australian universities with the highest contributions to the index in 2015. Assessing the research performance of universities is a difficult pursuit. Australia's two largest cities strive to attract the best researchers and produce science that makes a difference. Significant state government investment along with philanthropic largesse has helped drive Brisbane's research performance. The research sector loves talking about it but is excellence best for science? Proponents say the mega facility would contribute to major science breakthroughs if built. South Africa's University of the Western Cape has exceeded expectations. How should governments measure innovation? There is a need to account for all types of innovation, from big to small. Does pouring money into research always translate into better outcomes? The cell biologist's accolade is Japan's third consecutive Nobel Prize since 2014. Australia’s former chief scientist reflects on the country’s need to focus its research effort. A UN agency is connecting big pharma with research groups to accelerate development of treatments for diseases such as malaria. The illustrious prize has paid dividends for one Israeli research institute. The country's output of earth and environment science papers is growing. Is backing bright people a bright idea? Whether it is better to fund researchers or their ideas is an ongoing debate. Nature Index 2016 Rising Stars seeks to pinpoint the ascendant performers of science. Do longer periods of funding lead to greater scientific returns? Less prominent research nations are carving out a niche. As a continent, Europe is home to the most rising stars in the index. The research the company is publishing in top journals. Despite funding constraints, Chilean research is growing in some areas. Chemistry research was a significant driver of the performance for several institutions. Represented are institutions from the east and west coast. Who are the research world's rising stars? Undaunted by the scientific dominance of historic global big-hitters, some of the world's less prominent research nations are carving out a niche and making a strong impact. BCM’s contribution to high-quality research rose 39% from 2012 to 2015. A significant rise in chemistry research makes India a Nature Index 2016 Rising Star. An international team hunt for the origins of dog domestication. The country's contribution to top journals continues to grow. Collaborating close to home means solving mutual problems and forging regional networks. A ground breaking colon cancer experiment that swapped the burgers-and-fries diet of African Americans with the traditional fare of rural South Africans was sparked by a chance encounter. It is hard to predict how the result will impact the country's science and research landscape. A new detection system helped solve the mystery. Some UK universities may be affected more than others. Deep recession and a political crisis are hobbling the country and its recent research success, but one region hangs on. Links formed by mainland China's large scientific diaspora and its increasing output of high-quality research make it an emerging centre of international collaboration. Four of the top five universities producing the most earth and environment research in the index last year are in the United States. It's a battle between the east and west coast. Can international research funding help South Africa maintain its stellar performance in the index? International collaboration is yielding major breakthroughs and an increase in quality output. Growing participation in large international research projects may explain the drop in Canada's index performance. In climate modelling, one of the biggest impacts has the smallest of beginnings. What does industry contribute to the world's best research? The Nature Index tracks corporations who publish in top journals. In a troubled region, Saudi Arabia is capitalizing on its relative stability and resource wealth. A collaborative study included in the Nature Index required the coordinated efforts of more than 130 researchers from around the world. Strong connections with global scientific heavy-hitters and meaningful regional and domestic collaborations have thrust Saudi Arabia into a leading position in the Arab world. The Russian Academy of Sciences is the country's top producer of research, but its performance is slipping. Massachusetts General Hospital is the most prolific healthcare organisation publishing in top journals. The Max Planck Society’s pursuit of knowledge over application has helped the NGO top the Nature Index ranking for non-government research organisations. Saudi Arabia has a bold plan to diversify from its oil industry to create a knowledge economy. National research organisations take the top three spots in the latest Nature Index chemistry research rankings. IBM topped the Nature Index ranking of companies publishing in leading research journals in 2015. When it comes to the world’s best natural science research, no nation can match the United States. More than 20 researchers at China's genomics giant BGI got their PhD in Denmark. Could a 'Brexit' impact UK research partnerships? A handful of influential professors are behind research partnerships between Russia and Brazil. The incredible story behind a remarkable discovery. Collaborating can save money but does it produce better research? What's the best measure of research output? Can Japan halt the decline? 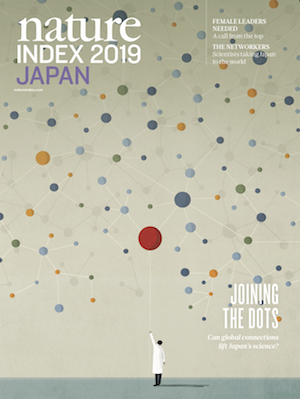 The small but focused snapshot of research afforded by the Nature Index helps fine-tune analysis of global scientific collaboration, say Jonathan Adams and Tamar Loach.